Warning! AustralianWritings.com is a part of Universal Research Inc. essay writing services network, notorious for the breach of contract and selling essays that have already been sold in the past. 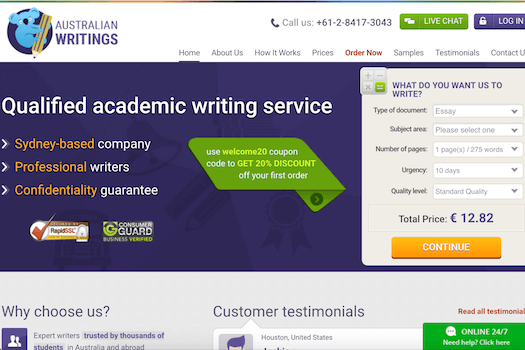 Here we have one more site AustralianWritings.com run by Universal Research Inc. Only this one claims to be based in Sydney since it is targeted towards Australian students who need help with essays. Also, the site says it offers reasonable prices for students, but taking into account an average quality of the essays, the service is actually expensive. While this "Australian site" claims it has top writers that are skilled at what they do, the truth is, they are underpaid and come from Kenya. Of course, there are fake paper sites reviews. You can read my research about BestEssays to learn about this company and its owner. AustralianWritings.com isn't the worst company out there, but you surely can find much better one that will give you just what you need without papers costing an arm and a leg.